The news about the HTC Incredible has been pouring out the last day or so. 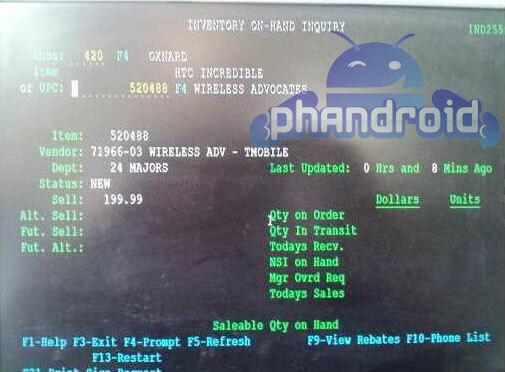 It has been spotted inside Verizon’s warehouse, according to the inventory computer. The tip came from a very reliable AndroidForums member. Then the Incredible appeared on Verizon’s website., in the form of a staging site. The webpage gave us little information about the Incredible, it was- a signup page for news on Verizon’s launch date, the fine print told us about activation fees, early termination fees and nothing really substantial, just your basic fine print from a carrier. Since yesterday’s tip about the staging site, Verizon has since locked down and password protected the page. 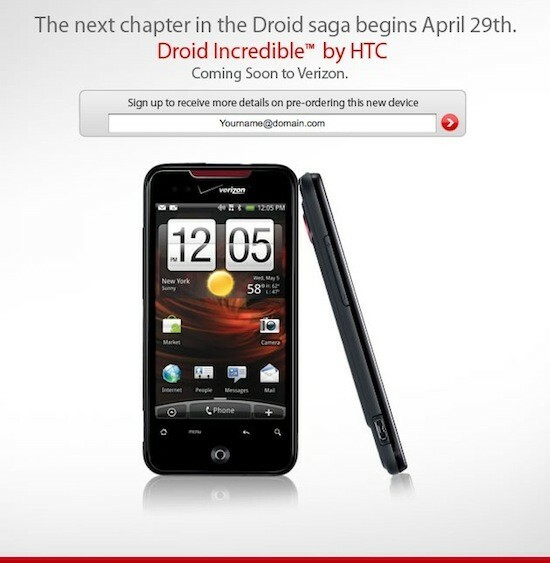 But the big news we learned from the page is that the HTC Incredible will be renamed to the Droid Incredible. “The next chapter in the Droid saga begins April 29th.” is what the bold print headline reads. This is could be the successor to the wildly popular Motorola Droid. This info has fully confirmed all of our suspicions about a Verizon launch. I’m sure once we near the April 29th launch date, Verizon will make a formal announcement about the re-branded Droid Incredible. • Processor: Qualcomm Snapdragon at 1 GHz. • Screen: 3.7-inch AMOLED at 480×800. • Radios: 1xRTT, EVDO Rev. A. • Weight: 4.6 ounces with battery. • Camera: 8MP with autofocus and flash. Now if all this wasn’t enough it seems that there is small possibility that the Incredible will be coming to T-Mobile. The members of Phandroid and AndroidForums are really up on their HTC Incredible news (I mean Droid Incredible). A member has found something on the CostCo inventory system. Apparently it shows that CostCo Wholesale will be offering the Incredible on 2 year contract with T-Mobile for $199.99. T-Mobile is in need of a high-end Android phone, but it has been pointed out that this is only a rumor. The company that is in charge of in-store distribution of wireless products for CostCo sells Verizon phones, so this could be simple computer error. Nobody knows why the T-Mobile’s name shows up in the database, instead of Verizon’s which would also seem plausible. Android fans have a lot to look forward to in the coming weeks! One Response to HTC Incredible News: Leaked Specs, T-Mobile?